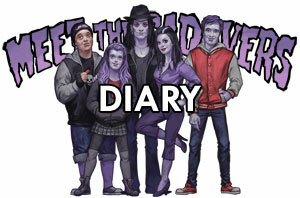 MEET THE CADAVERS - UK Comedy Horror - Coming 2014! A list of Festivals, ComicCons, Expos and other events that various members of Team Cadaver will be attending throughout 2014-15. New dates listed regularly so check back soon! An opportunity for you to meet writer, producer, co-director and Victor Cadaver himself - Zion - plus producer and Kelly Cadaver, Vikki. Come along, grab a poster, grab some postcards and grab an autograph or two as well! Nothing booked yet - check back soon! Vikki and I (Zion) will be attending the 2014 Cannes Film Festival in France taking with us an Extended Trailer for MTC!